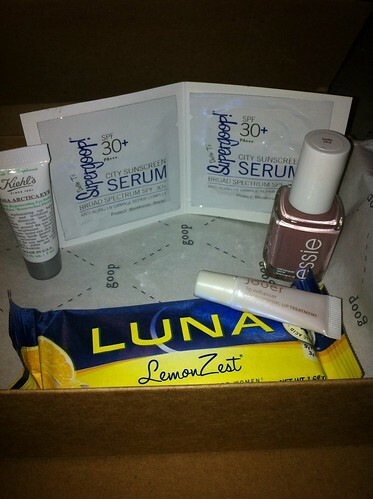 So this month for my Birchbox I had a choice, a GOOP Birchbox or a regular Birchbox. 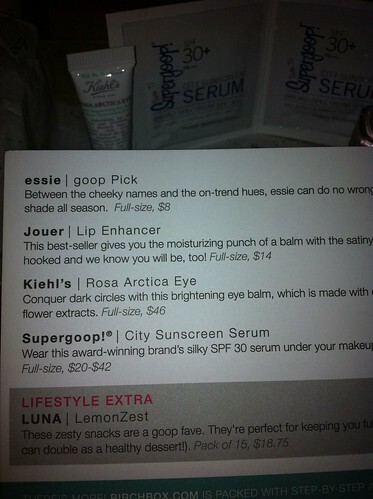 I chose a GOOP Birchbox because, hey. Goop. I don't actually know that GOOP is. I looked at their website and from what I can tell, without subscribing, you sign up and they tell you what is cool. I think this is awesome because, I have to accept that I'm 44 and I no longer know what is cool. I'm okay with some 20 somethings telling me what's cool. I reserve the right to tell them to get off my damn lawn. But as a mom of four, I gotta admit, I buy stuff for my self less than ever so it's festive to me that things come in a magic box once a month. This month it's got two full size things - a LUNA bar which I'm guessing is some sort of granola bar, meal bar thing, and bottle of Essie nail polish (WIN) in a fall color that I do like a lot. So basically right there, I got my ten bucks worth. This is the card that comes with to tell you about the products you've gotten.The two wee bottles are sample sizes of various face skin stuff, lip enhancer (for DSL) and under eye cream (for us old chix) so, yay. Things in flat rip open packets I will forever forget so, it's some sort of sun screen I will never use. Also, I signed up for Goop. Nice marketing Goop.